When we encounter the Moon, we see a path that leads off into the distance. On either side of the path stand a wolf and a dog, representing our animalistic nature - one is civilized, and the other wild and feral. There is a crawfish that is crawling out of the pond from which the path stems from. In the distance, we can see two towers flanking the central path, once again alluding to the doubles visible in this card. Everything in this card seems to echo the other, as if to allude to two possibilities. When we walk down the path, we walk the fine line between conscious and unconscious, between the tamed side of civilization of the dog, and the forces of nature represented by the wolf. The towers on the opposing ends represent the forces of good and evil, and their similarity in appearance can allude to the difficulties that we face in distinguishing between them. 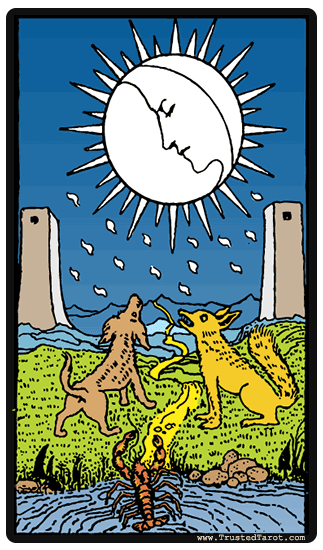 On one hand, the Moon card can symbolize your imagination is taking the best of you. In the dark of the night, you are taking a path that you are unsure of, for there could be danger lurking in its depths. You are the crawfish embarking on the path in the card. The moon's light can bring you clarity and understanding and you should allow your intuition to guide you through this darkness. The moon's light can bring you clarity and understanding and you should allow your intuition to guide you through this darkness. You need to be aware of the situations that are causing fear and anxiety in your mind, whether it is now or in the future. It alerts you not to allow inner disturbances and self-deception to take the best of you. These deep memories and fears must be let go, and the negative energies must be released and turned into something constructive. A Moon reversal in a reading can sometimes indicate that the darker and more negative aspects of the moon are present in your life. It could represent confusion and unhappiness - you want to make progress, but you are not sure what is the right thing to do. You must deal with your anxiety and fears by overcoming them, for they are like shadows in the dark. It is time to believe in yourself and move forward. The moon reversal meaning indicates that you are in an intuitive period or you have recently battled confusion, anxiety, and self-deception. It could be that you are misinterpreting how you have been feeling however you are starting to improve on this. Another reversed moon meaning is that the forces of the night that are bringing you confusion are starting to dissipate. You have started managing your fears and anxiety. Whatever negative energies you have been facing are slowly fading away. It presents a liberating experience as you discover the positive side of things.